Crack Scratchings, is really what I should call this recipe. Though it sounds like something a withdrawing addict may be going through. So let’s settle for Pork Scratchings with Toffee and Pepperberry Salt. Slightly longer than the crack title, but you get the complete picture on this must have recipe (without the image of some scrawny person picking at their arms). The problem is, and why the crack reference, you can’t stop eating this stuff once you have started. There is crunchy pork crackling deliciousness, which is then married with a waved drizzle of hard toffee. This is all finished off with Australian pepperberry salt. Pepperberry salt? Pepperberry is an Australian native ingredient, which can be found growing from Tasmania right through to the Barrington Tops in NSW. It is an Aussie pepper, with a mild fruity pepper flavour. Quite unique, and once tried, will become a staple in your pantry. I have a dwindling supply of pepperbery salt, which came back with me from my visit to Tasman Sea Salt in Tasmania. If you can’t get your hands on pepperberry salt, or pepperberries to make your own, I would just use salt or salt and a little Sichuan or pink peppercorns. We are after the salty sweet combo for these pork scratchings. Did you know that pepperberries have three times the antioxidants of blueberries? Not a difficult recipe to make at all. What I love, is it is something you cannot purchase from a store. You have a unique nibble for your guests at your next soiree, or you can keep them all to yourself. No judgement here, and it won’t be hard to do. Pork Scratchings with Toffee and Pepperberry Salt. 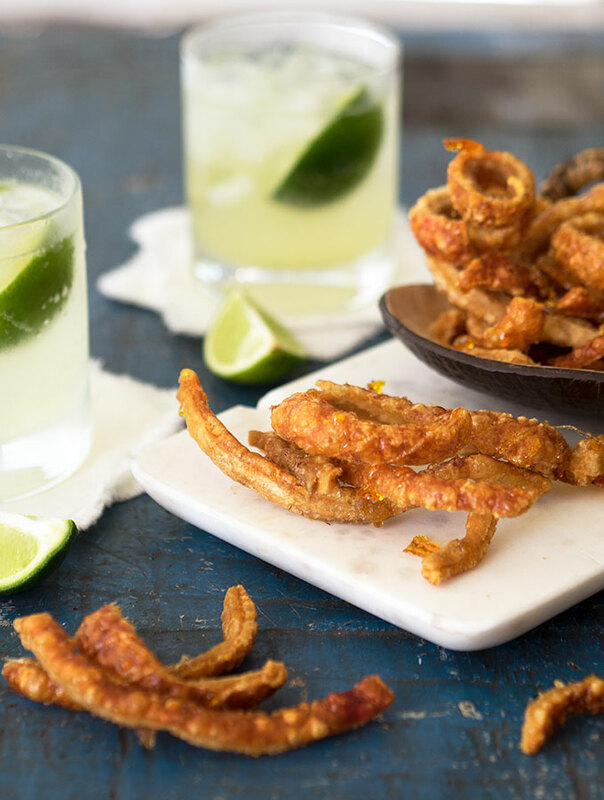 Perfect pork crackling with a salty sweet kick, goes well with cider or beer. 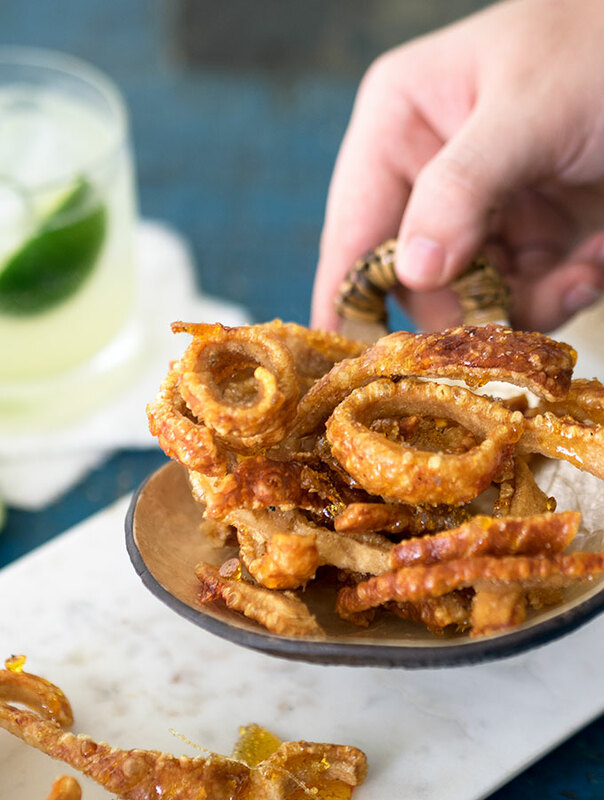 Place pork rind on a cake rack in your fridge over night, or at least a few hours to dry. With a sharp knife cut pork rind into 1-2cm strips. Don’t pull out a ruler, this is easy cooking. Toss the pork rind strips through the pepperberry salt with a splash of olive oil. Leave to marinate for an hour. Pre-heat oven to 220°C (430°F). Place prepared pork rind on a baking tray that has been lined with baking paper. Make sure you use a baking tray with sides, as the rind will release oil. Keep checking on your pork rind as it cooks. Pour off any extra oil/fat from time to time. 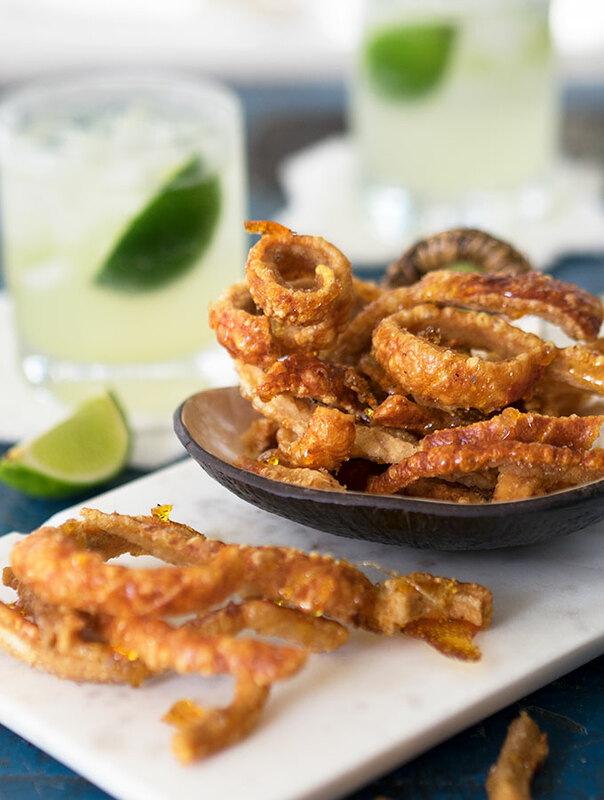 The pork rind is ready when it is puffed, crunchy and golden. This can take anywhere from 30-45 minutes depending on the moisture content of your rind. Once rind, now crackling, is ready, remove from oven and place on kitchen towel to absorb any extra oil. Place crackling on tray lined with baking paper. In a heavy based saucepan place sugar and 60ml (¼ cup) of water. Stir until sugar has dissolved and then bring to the boil. Keep boiling until the sugar water mixture has become a dark golden colour. 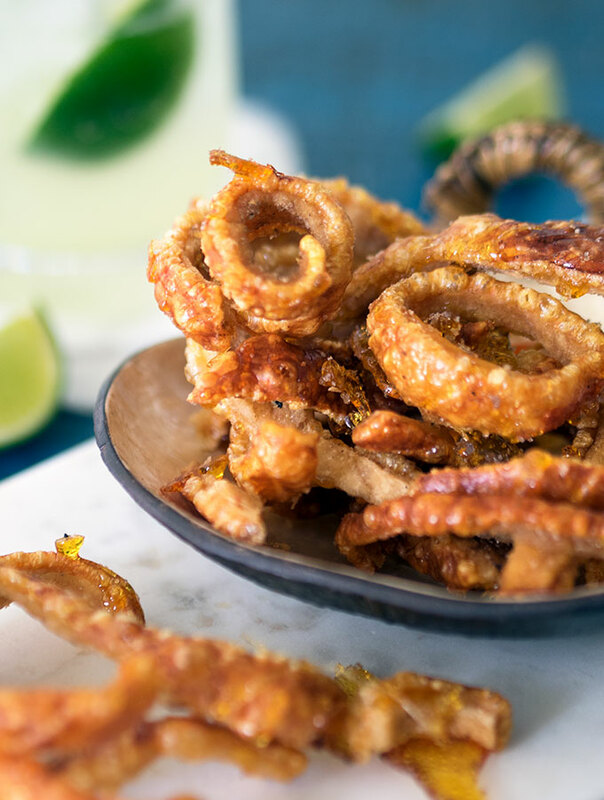 Remove from the heat immediately and drizzle over the pork crackling. Sprinkle with extra pepperbery salt and leave to harden. Perfect with a beer or a crisp apple cider. When I originally made this recipe I harped at the boys to eat the scratchings quickly. I had a great fear the toffee would go tacky and the crackling soggy rather quickly, especially in a humid Australian summer. I can report that all crackling had been devoured by day 4 of making. After 4 days the toffee was still hard and as brittle as the day it was made. The pork scratchings were as crunchy as day one. I was pretty impressed. What would we do without air tight containers! Oh. My. Goodness. These look amazing!! This sounds kind of amazing. I’ve never heard of pepperberry before – I’ll have to see if I can buy any here! And I’d call these pork rinds 😀 Love differing terminology. This sounds like such an interesting combination of flavors. I’m sure that’s why it is totally addicting! I need to check out the pepperberry salt..since I’ve never had that. I have a growing collection of gourmet salts.. and I have never ever HEARD of pepperberry salt! I NEEEEED some lol!!!! I would not be able to stop eating them!! This has to take the prize for the most unique recipe I have seen since…um….well, ever! It sounds scrumptious. Those pork scratchings look divine Sara! omgggg that looks so fricken good!